Take a journey to the Old West while sitting behind your laptop or desktop computer. 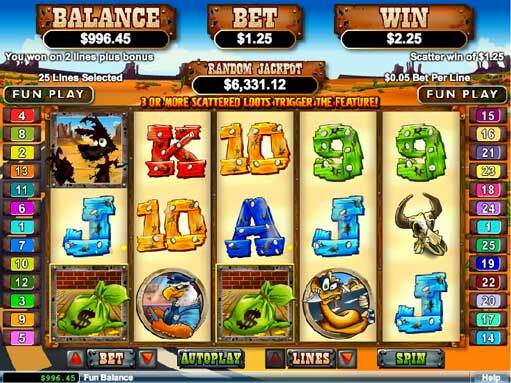 Coyote Cash is a five reel, twenty-five pay line machine with a Wild West / Roadrunner / Old West theme that is powered by Real Time Gaming software. The inspiration for Coyote Cash was most likely from a classic Looney Tunes animated cartoon series. This game features a progressive jackpot triggers at random and has several other cool features like free spins, multipliers, wild substitutes and scatters wins. Feel free to play Coyote Cash video slots for real money at any of the US-facing casino gambling sites listed on the bottom right-hand side of this review page. Like most RTG games, this game has a nice sized betting range. Once you have loaded the game, you will need to select the amount of cash you want to bet. The coin denominations in “Coyote Cash” are one penny, $0.02, $0.03, $0.04, $0.05, $0.06, $0.07, $0.08, $0.09, $0.10, $0.25, $0.50, $1, two dollars fifty cents and five dollars. You have the option to wager as little as a cent and as much as over one hundred dollars per spin. Now, all that you have to do is just click the Spin” or the “Au­top­lay­” button to start playing. 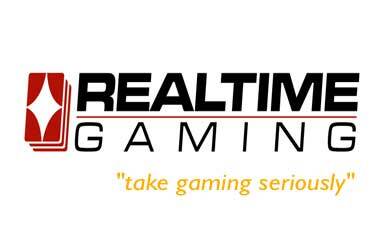 The icons in this game do not have the greatest graphics as it was made way before Real Time Gaming (RTG) software started to make their classic and video slot machines in 3D. When spinning the reels, you will see traditional poker playing card symbols like the Queen, the Jack, the Nice, the King, the Ace, the Nine and the Ten. However, these icons appear to be on wooden boards that are nailed together in an old school Wild West way. There other images that you will see are a bank robbing coyote in the Wild West (the coyote), a cactus, a bull symbol, a skull, an armored truck. A snake with a dagger, a bald eagle cop, and a loot symbol. The most important icons in the game are the coyote, the loot symbol. The Coyote is the wild, and the Loot is the scatter symbol. When you land five of the Wild Coyote icons on the reels, you will win the 10,000 fixed coin jackpot. They will also substitute for all of the other symbols on the wheels to help you put together a winning combination. You can enjoy Coyote Cash on the Internet using the instant play no download format, or you can download the software to your desktop or laptop computer. Also, if you like to use your Smartphone or tablet, this game works with most mobile devices, including iOS devices. 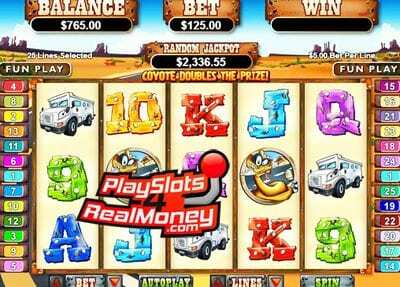 Coyote Cash has cops and robber theme that fits nicely into a five reel video slot machine with 25 pay lines. You can vicariously break the law, steal, rob banks and bust open vaults filled with cash while playing this game from your home or at the office. With tons of ways to win, Coyote Cash brings the old-school wild west to your Smartphone and tablet screen. Click spin or auto spin and double your prize after scoring winning combinations.